Need an easy, healthy appetizer to make for a special occasion? Try these mini quiche using premade pastry shells. The fat content of this hors d’oeuvres is reduced compared to its traditional counterpart by using egg whites, fat-free evaporated milk, and reduced-fat feta cheese. To help you find the ingredients that fit best with your nutritional and health needs, use your “Shop to Lose“, “Eat This?”, and “Eat What?” apps for the iPhone. Click here for the recipe. 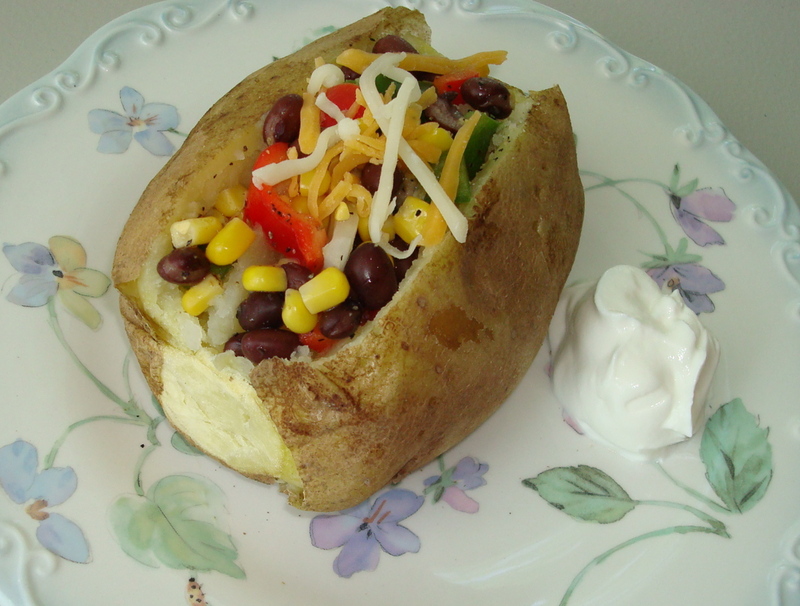 The Summer Fiesta Black Bean Salad is great on its own or as a topping for a baked potato! Welcome to Putting it on the Plate with PICKKA. Today’s featured recipe is Summer Fiesta Black Bean Salad. I decided to use my “Shop to Lose” app for the iPhone to choose the ingredients for this dish. The Shop to Lose app contains a “smart shopping list” which analyzes and screens grocery store foods based on my weight and health objectives, as well as those of other family members. It’s a great way to ensure that my pantry items are healthy for me and my family. I am glad I chose to use “Shop to Lose”* because I discovered something new that I would not have considered otherwise. My recipe calls for black beans – not a product that I would consider to have many variances between brands. But, my “Shop to Lose” app brought to my attention that the sugar content between my choices differed slightly. One had no sugar and the other had 1 gram. What is nice about the “Shop to Lose” app is that it highlights why a product is a good choice or a bad choice under the nutrition label displayed on the app. It will tell you if the product is low in sugar or high in fat, for instance. That is how I discovered the sugar difference – and I thought I was pretty savvy at deciphering nutrition labels. I think you will find today’s recipe to be very easy to pull together at the last minute because many of the items are pantry staples. It is also very versatile. You can serve it as a side dish, use it to top baked potatoes (as I did), or add it to a bed of whole-grain rice for a healthy meal. It it a great dish to pass at potlucks, barbecues, and picnics too! In a medium bowl add corn, black beans, bell peppers, onion, and garlic. Drizzle olive oil and lime juice over mixture. Sprinkle with ground cumin. Stir until mixture is coated. Add salt and pepper to taste. Serve. *Click here to download the “Shop to Lose” app. Try this recipe and come back and tell us how you served it, we want to know! Oven-baking pancakes can cut down on the fat. Traditionally prepared and cooked pancakes can mean consuming a lot of extra calories from fat and carbs. But, there are a few tricks that can make this comfort food healthier. To cut down on the fat, try oven-baking the pancakes. You can reduce the sugar content by lightly dusting the cooked pancakes with powdered sugar, rather than dousing them with maple syrup. The fiber content can be increased by using pancake mix made of whole-grain flour. 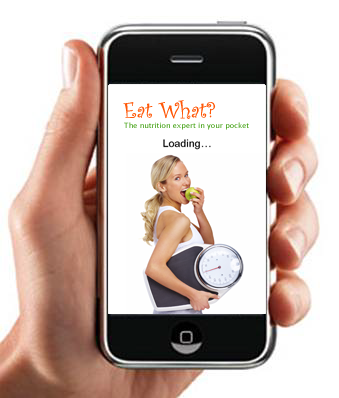 And, use your “Eat What?” app for the iPhone to find a pancake mix that fits into your diet plan. 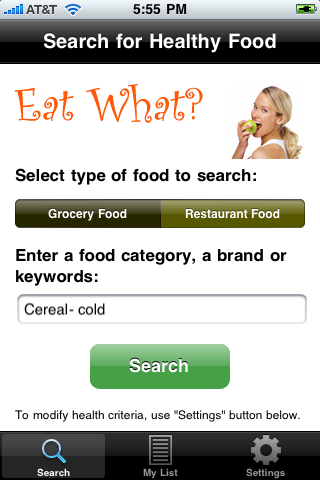 The “Eat What?” app provides you with a list of recommended products in the food category that you are interested. 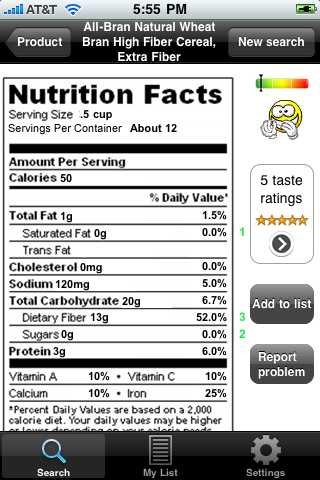 A great feature of this app is that it allows you to modify the search criteria for the saturated fat, sugar, carbohydrate, and fiber content of the product (e.g., choose from “no saturated fat,” “low saturated fat,” “reduced saturated fat,” or “ignore” categories). By modifying my search, I reduced the number of options from which I had to choose and increased my chances of getting the right product for me. 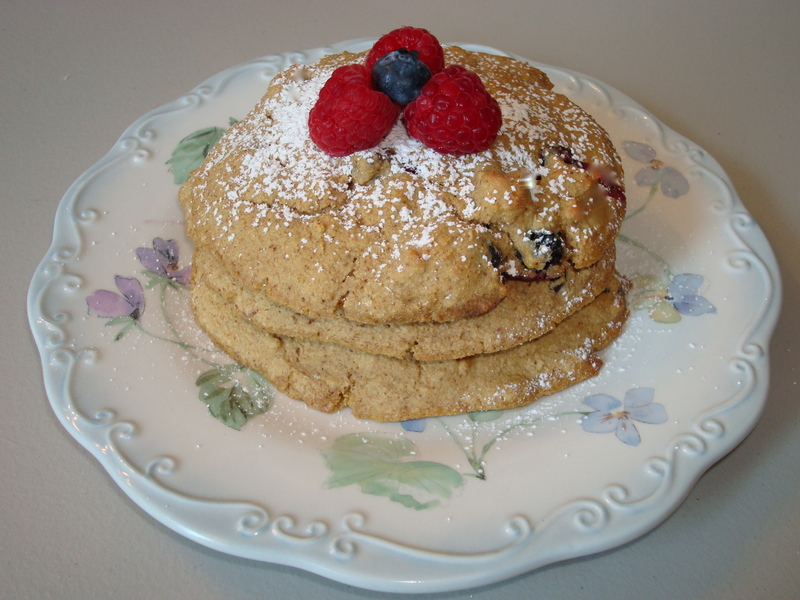 I chose an oatmeal pancake mix to make oven-baked oatmeal-blueberry pancakes for my family. Here is what I did to make them. First, I preheated the oven to 375 degrees Fahrenheit. Then, I sprayed a cookie sheet with non-stick cooking spray and set it aside. Next, I followed the pancake package directions for the number of pancakes I wanted to make (14-18 pancakes). I added 1 tsp of baking powder to the batter and combined it. 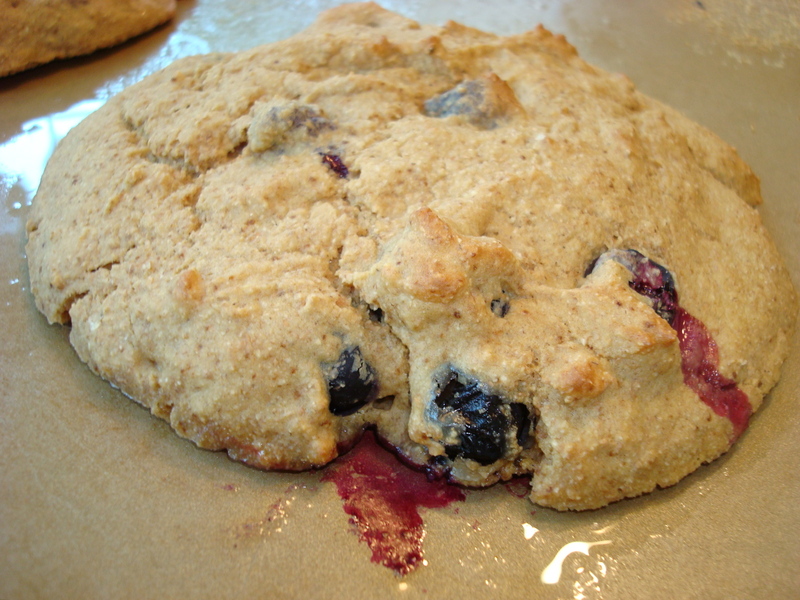 Then, I folded in fresh blueberries (about 1/4 cup per 1 cup of dry mix). Using 1/4 cup of batter per pancake, I poured the mixture onto the baking sheet – separating pancakes by about 3 inches. ** Then, I baked them for approximately 8 minutes. The pancakes will resemble large cookies when done. Oven-baked pancakes will resemble large cookies when done. **Note, my family likes pancakes from thick batter which holds its form on a cold baking sheet. If you like thin batter, preheat the baking sheet prior to pouring the mixture onto it to prevent it from spreading out too much prior to cooking. What is your favorite way to make pancakes? Share with us, we want to know! This healthier version of tuna noodle casserole relies on a lemon-olive oil dressing rather than a heavy cream base for flavor. I came across the idea for this healthier version of tuna noodle casserole a few years back and, after a few tweaks here and there, have used it ever since as one of my “go-to” recipes when I’m in a pinch. Most of the ingredients are staples found in the pantry and ice box so it is easy to throw together when you are short for time. By replacing the heavy cream base of the traditional tuna noodle casserole with a lemon juice-olive oil dressing, the saturated fat content of this meal can be reduced. Although I am an advocate for using whole-grain pasta, for this particular dish I wanted a milder tasting noodle that would not compete with the other flavors. 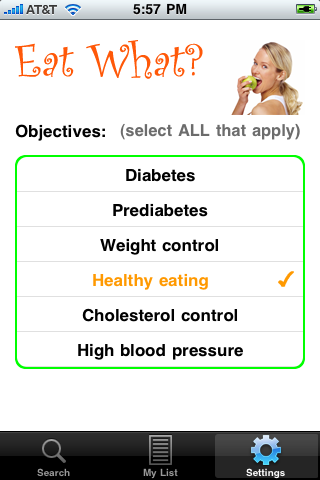 Therefore, I used my Evincii/PICKKA’s “Eat This?” app for the iPhone to help me find a satisfactory alternative. After entering my health objectives, I started scanning pasta products. To my suprise, my choice for a milder tasting pasta fell into the “Good Choice” category as did its whole-grain counterpart. 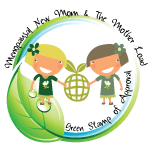 I was content with my choice and felt reassured that it was a healthy alternative. Rinse cooked pasta in cold water and drain. Place pasta into a large bowl. Add yellow pepper, green onion, peas, and tuna fish. Mix to combine the ingredients. Pour lemon-olive oil dressing over pasta mixture and toss to coat. Sprinkle with parmesan cheese. 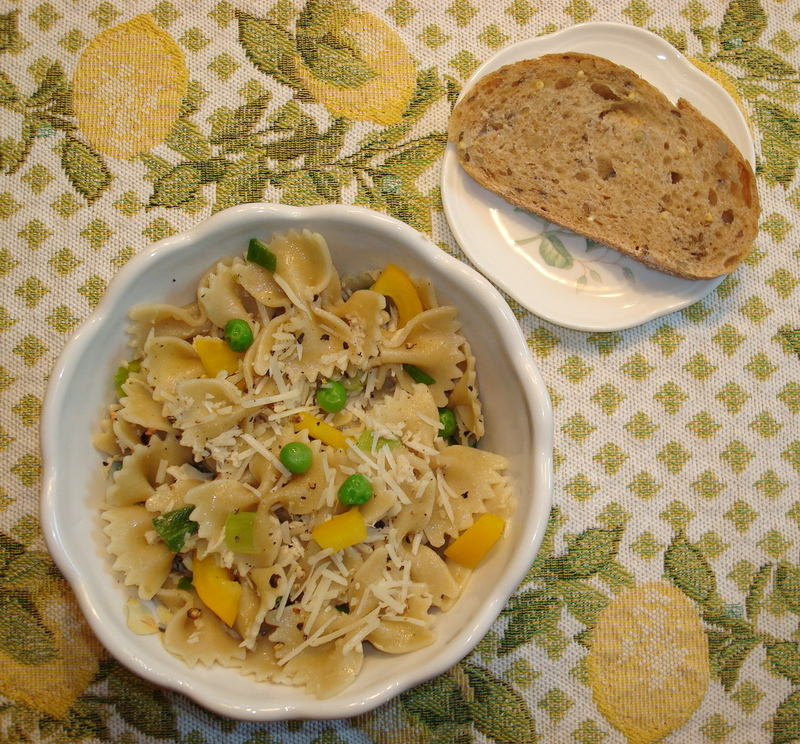 Serve with whole-grain bread. *Lemon-Olive Oil Dressing: In a small bowl wisk together 1/2 cup extra-virgin olive oil; 3 TBS lemon juice; 3 crushed cloves of garlic; 1 tsp white vinegar; 1/2 tsp of sea salt; 1/2 tsp freshly ground pepper. What is your favorite way to eat tuna fish? Share with us, we want to know! A broiled peach topped with reduced-fat ice cream makes for a healthier, yet sweetly satisfying, dessert. I decided to get a little “peachy” with the Father’s Day dessert this year. My choice? 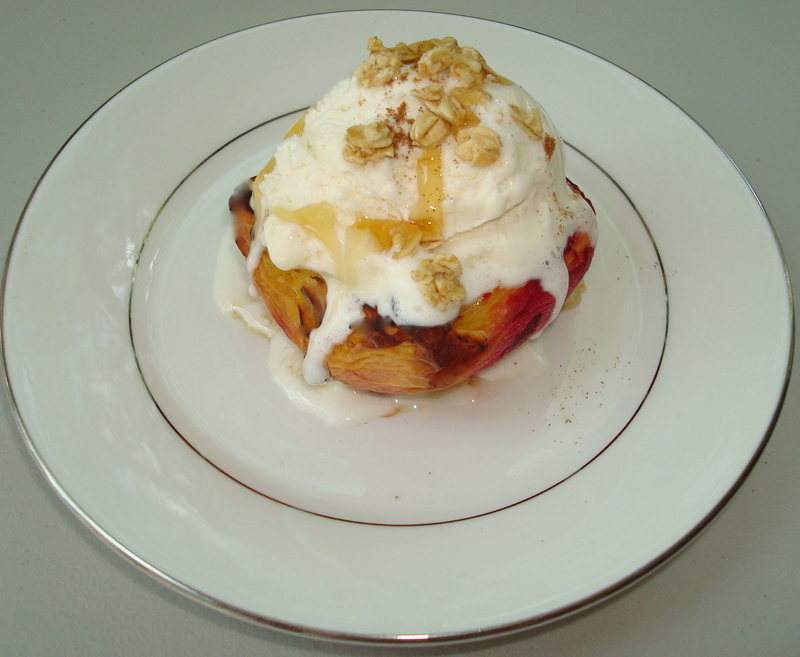 Broiled peaches with reduced-fat vanilla ice cream. Why? I wanted to make something that could be prepared in individual servings to prevent overindulging on leftovers later (as would happen with me and a pie). Yet, I wanted the dessert to be satisfying enough that there wasn’t a residing feeling of being “cheated” out of dessert. 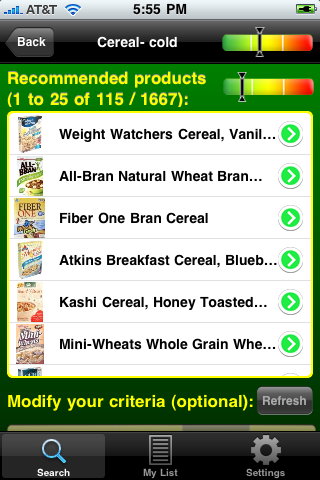 I used my Evincii/PICKKA “Eat This?” app for the iPhone to help me find the right ice cream and granola for my goals. My first choice for ice cream fell into the “Not Too Bad” category. I wasn’t pleased with this. I wanted an ice cream that fell into a healthier category because the main course would be higher in calories because of the special occasion. Therefore, I used the “View Healthy Alternatives” option of the app and found an ice cream that was categorized as a “Good Choice.” Next, I used my “Eat This?” app to find granola. 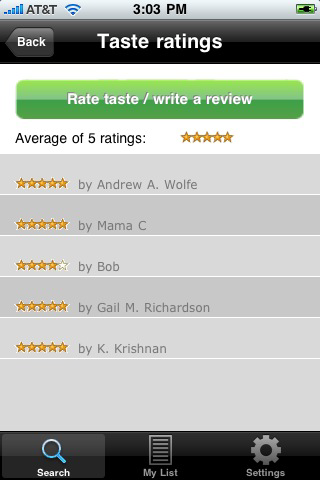 My choice fell in the “OK Choice,” but I saw on my app that three other consumers gave it a five star taste rating. Because only 1 tsp would be served to each individual, I decided it was an acceptable choice, especially since other purchasers indicated it was tasty. Preheat the broiler. Wash and pat dry peaches. Carefully slice each peach in half and remove the pit. Place peaches, cut-side up, on broiler pan lined with aluminum foil. Place in the oven about 3 inches from the heat. Cook until juices start to bubble and peaches are browned (about 3-5 minutes). Remove from the oven. Let cool for 3-5 minutes. Place peaches on individual dessert plates. Scoop reduced-fat vanilla ice cream on top of each peach half. Sprinkle with cinnamon and granola. Drizzle honey over the top. Serve immediately. What will you be serving for dessert this Father’s Day? Will you use your “Eat This?” app to help you find the right ingredients? Share with us, we want to know!